Wondering what exactly makes kosher kimchi? It is simply using Kosher Korean pepper paste. 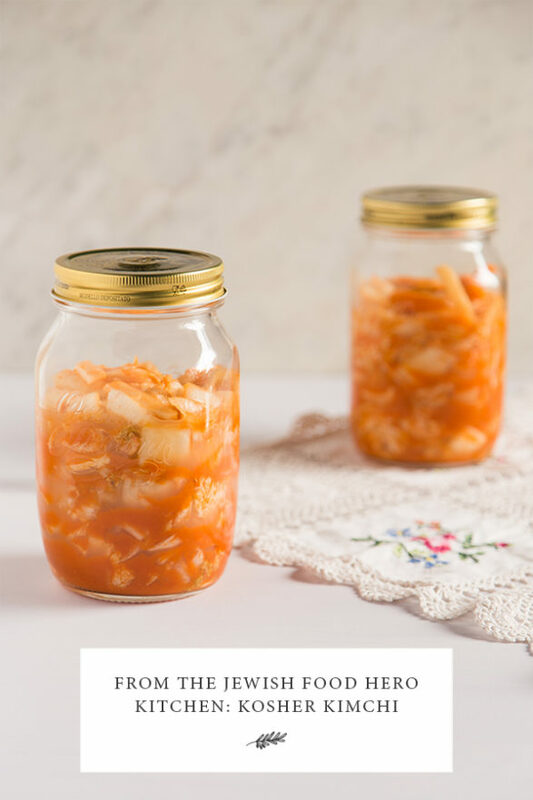 Kimchi is therapeutic to eat as it is filled with vitamins A, B, and C, but its biggest benefit may be in its “healthy bacteria” called lactobacilli, found in fermented foods. Kimchi (like other fermented foods) is therapeutic to make too as it is very tactile and almost magical. To learn more about fermentation, read this interview with fermentation expert Sandor Katz. P.S. Aqqo is offering 15% off their grooved weights with handles perfect for pickling and fermentation. Use code: 43QY62DS. Valid from October 2, 2017-2 April 2018.